Unusual UK event spaces hidden within existing venues. The Tower is a four-storey octagonal building that dates back to Victorian times. It was originally designed to provide a panoramic view of Swansea Bay and the surrounding area. Restored in 2006, it now provides a self-contained space with accommodation and conference facilities. The Tower can cater for up to eight delegates in the boardroom and has three bedrooms. The main hotel, meanwhile, has meeting facilities for up to 250 delegates and a spa offering four treatment rooms. Past clients have included Pfizer, clothing manufacturer Billabong and estate agent Astleys. The five-star Swissotel in London has created a temporary event space available from October 2009 until the end of February 2010. The Swiss Chalet has been constructed in the hotel's courtyard garden. Complete with wooden furniture shipped from Zurich and detailed down to its cuckoo clock, the space can accommodate up to 250 delegates when combined with 12 Temple Place Restaurant. Special Swiss menus featuring fondues and schnitzels can be served, or the chalet can be used as a creative meeting space and is adjacent to the hotel's existing meeting facilities - the Arundel Room and Fitzalan suites that can accommodate up to 150 guests. 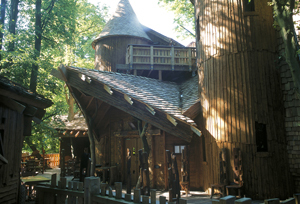 Procter & Gamble and the NHS are among the organisations to have held events at the Treehouse at Alnwick Garden. The venue, which is only available for dinners or evening receptions, can be booked year-round and can host up to 80. The Treehouse, one of the world's largest, is set high in the canopy of the garden's mature lime trees. Alnwick Garden was created by the Duchess of Northumberland to be a contemporary public garden. As well as the Treehouse, groups can also hire the Pavilion for a variety of events, including garden parties for up to 2,000. Livingstone Lodge is an overnight safari lodge, the first of its kind in Europe, and the perfect answer for cash-strapped groups looking for adventure. Open from April until October each year, it is located in Port Lympne Wild Animal Park in Kent. It can accommodate 18 guests. Itineraries feature an overnight stay, guided tours of the park to take in feeding times for the giraffes, rhinos and zebras, as well as dinner and breakfast. Lodge manager Jo Furner says corporate groups can include a stay at the lodge as part of a meeting at the Mansion House, which seats 150 delegates theatre-style in its largest room. The former residence of the Topham family, owners of Aintree Racecourse until the 1970s, Paddock Lodge was launched as an event space in 2008. The house, which overlooks the parade ring, can be used for receptions, product launches or creative events. It can host groups of up to 100 but as the house remains largely unchanged, it cannot seat big groups in one area. Paddock Lodge is a popular choice for corporate hospitality during the Grand National with VIP packages sold through Keith Prowse. The facility also complements the racecourse's other meeting spaces, which can seat up to 600 delegates. The Hospitium is a two-storey, 14th-century listed building located in York's Museum Gardens. The hall's function has changed over the years, although it is believed in its time to have been used as a guesthouse, storage building and then as a museum of antiquities in 1850. The latest refurbishment, completed in April 2008, has created an unusual conference and events space. The Hospitium is available for hire both during the day and the evening. The upper floor is well suited to presentations and can seat 170 delegates theatre-style or 200 for a reception. Groups can also make use of the 300-seat auditorium in the neighbouring Tempest Anderson Hall.